Benefits : "An apple a day keeps the doctor away". 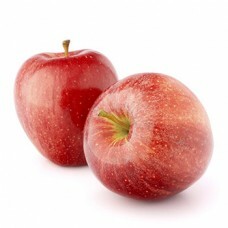 Apples may reduce the risk of colon cancer, prostate cancer and lung cancer. Apple peels contain frolic acid which increases skeletal muscle and brown fat, and decreases white fat, obesity, glucose intolerance, and fatty liver disease. Apple peels are a source of various phytochemicals with unknown nutritional value and possible antioxidant activity in vitro.